Police in North Carolina have released body-camera footage of the fatal shooting of a woman holding a knife. Chieu Di Thi Vo, 46, was shot and killed by an officer, Tim Bloch, on March 25, 2014. The video footage (it can be viewed here; but it is quite disturbing) was released this week. She was chasing after her mother with an 8-inch butcher’s knife. Bloch is heard telling her to drop the knife before he opens fire, hitting her several times. Police were called to a Greensboro apartment complex after reports of a fight. Vo, who is from Vietnam and did not speak English, was having an argument with her mother and was shouting at her when cops arrived on the scene. 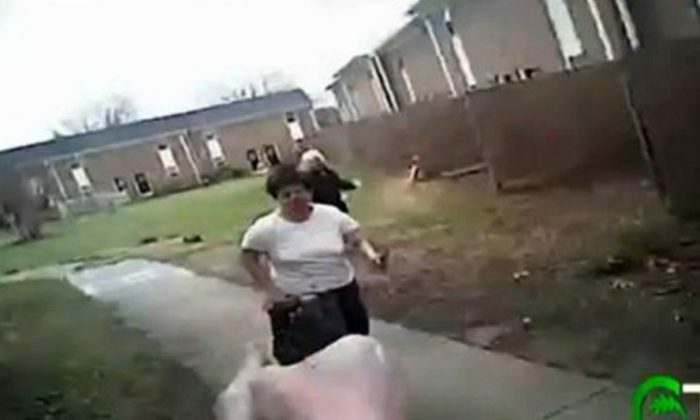 Police said that she came at the officer with a meat cleaver and refused orders to drop it, FOX 8 News reported. Since then, Vo’s family have said that the use of deadly force was unnecessary. The clip was released at the request of Vo’s family. They said that Vo had been suffering from bipolar disorder. The Greensboro Police Department has maintained that Bloch, who doesn’t work in law enforcement anymore, used “justified and reasonable” force, according to a news release. “Many lives have been touched by this incident. Both the Vo family and the Bloch (police officer’s) family have been affected by this tragedy,” added Scott. An attorney for Vo’s family, Tin Thanh Nguyen, said they had to see the footage.